In an almost endless jumble of smart home manufacturers and almost as many wireless standards, you always have to wonder if components can be networked with one another or not. Can a Bosch motion detector turn on my Philips lamps? In fact, there are solutions to these problems and ways to mediate between the many different standards. We dived into the heart of the matter and took a closer look at two concepts. In this first article we’ll look at the Athom Homey as an offline alternative, and then later we’ll test the Conrad Connect as an online alternative. Home automation is a beautiful thing, especially when nobody is home. When a storm starts, it makes absolute sense to close the shutters and windows. When the mailman rings, it might be a good idea to open the door and watch him on the security camera. And if the CO2 level in the basement is suddenly too high, it'd be nice to switch on the light immediately and check what’s going on with the camera. All of these things can be implemented, but the solutions to these problems are from manufacturers that are charging a fortune. As a customer, however, you could buy sensors, cameras and lamps from the cheapest manufacturers and then network them yourself. The only problem is that the many wireless standards from various manufacturers prevent you from doing this. And even if two manufacturers use the same wireless standard, it doesn’t mean the devices can interact with one another. The Conrad electronics subsidiary Conrad Connect and the Dutch start-up Athom offer approaches to mediation. The German Conrad Connect builds a bridge online and networks several smart home devices that can be operated via web interfaces. Athom Homey, on the other hand, chooses a more direct route and seeks to replace all the connection bridges in your house with a single one. The different approaches have the same goal: to bring everything together that doesn’t belong together. Now you have to consider what your real goal is: if you want to reduce the number of bridges in your house, Athom Homey is your first choice. The small globe will cost you 299 euros (which is around 360 dollars). ... it covers a wide spectrum. The manufacturers that are already integrated include Aldi, Bosch-Siemens Home Control, Devolo, Dyson, Google Chromecast, Ikea, Nanoleaf, Neato, Nest, NetAtmo, Nuki Smart Lock, Osram Lightify, Philips Hue, Roomba, Samsung Smart TV, Sonos, Synology Surveillance, tado, TP-Link and many inexpensive alternatives. Additional integrations like IFTTT, Telegram, HomeKit, Slack, SMS or Twitter multiply the possible interactions with your smart home. And yes, SMS really means that you can unlock your home smart lock via SMS. Atom’s great ambition is to replace all bridges with a single solution. 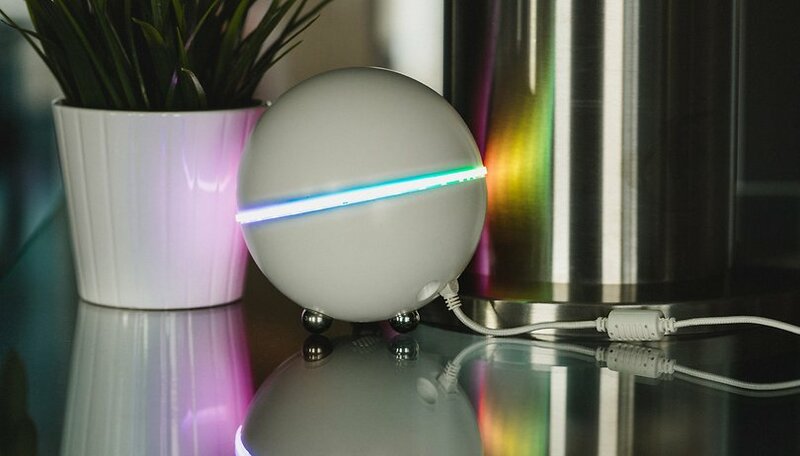 Ideally you should buy the Homey first, and then compatible lamps and other devices. You can buy them without their bridges and save yourself from their rather high prices. Unfortunately, in some cases this doesn’t work out as well as you’d hope. The bridgeless pairing with Philips Hue Lamps, for example, turns out to be inadequate, but this isn’t Athom’s fault. Lamps that were already coupled to a Hue bridge cannot be put into a coupling mode without a Hue bridge, or if they can it’s very complicated. Athom strongly recommends that Philips Hue be used in combination with the Hue Bridge. There is, however, an excellent unofficial bridge-less solution from the remarkable Athom community. In the test setup consisting of Devolo Home Control door/window contacts and Philips Hue Shape Light we were able to use Devolo without a bridge. The Shape Light is also compatible with Homey without a bridge through the community apps mentioned above. It’s also suitable for the flow that we programmed. Thanks to the bridge-less combination, Homey could help you save a lot of money here. And you don't need to sign up for the online services of Devolo or Philips. A lot of overhead becomes superfluous with Homey. One question left unanswered is how to provide individual devices with updates. This is usually done via the respective bridge or app. If these vectors are eliminated by Homey, Athom would have to offer manufacturers an alternative route for updates. In the test, however, we couldn’t observe that a connected device received an update. The Homey is currently configured via app or web interface; in both cases networking is done via your Athom user account. However, new devices can only be connected on the desktop and not on a smartphone. Programs for Windows or Mac OC are already available, but I didn’t want to test them on Linux. For Linux users, the web interface via Google Chrome is still recommended. Athom quickly gave up Homey’s voice control, so this form of operation also wasn’t tested. You could theoretically upgrade it with Echo Dot and Alexa Skill. One of the most challenging riddles was Athom’s management of the Wi-Fi password. Once connected to Wi-Fi, the Wi-Fi can only be changed in recovery mode. Homey is always one click away from completely deleting your data, and that can ruin a lot of what you’ve done. Athom is showing great potential. We had the Homey in operation for half a year. Throughout this time, the manufacturer has prepared launches in more markets. In the meantime, the software department consistently improved the difficulties with the setup and was able to integrate new smart home hardware. Homey seems to be delivering. However, it’s recommended that you first select compatible devices and then buy the Homey. As the example of Philips Hue shows, it can be difficult to free coupled devices from their first bridge. Athom still has to solve the update problem, learn more languages and fix some bugs in the software, and then the Homey will become a really good product. At the moment it’s already a really successful feasibility study. What do you think? Does the Homey sound useful to you?